Have you ever wondered why it seems like men are running Canada? Men are running our government. Men are running most major businesses. Men are even running our elementary schools! If you answered yes to the original question, continue reading to understand why this is still the case. Women began entering the workforce more and more in the 1960s. Their numbers continued to grow. Women leaving home to work is not a new phenomenon, so why is it that women still struggle to advance in the management hierarchy? Although it is reasonable to expect that professions with more women than men in the field, like education, should have be largely managed by women, but this is rarely the case. In the 1960s, women held about 1% of managerial roles in Canada. Things improved and by 1978, 14.1% of managerial roles were occupied by women. Today, women make up more than half of the Canadian workforce. According to Statistics Canada, 17% of these women worked in managerial roles in 2010, but they constitute fewer than one in five senior managers. For women progress has been slow and moving up the managerial hierarchy into senior management remains difficult. Catalyst Canada estimates that at this rate of change, women will occupy only one in four senior management positions by 2024. Source. The higher up one goes, the fewer women occupy positions of power. Source. Women have more chance of excelling in some professions than others. This is primarily due to higher numbers of women entering some fields at the university level. 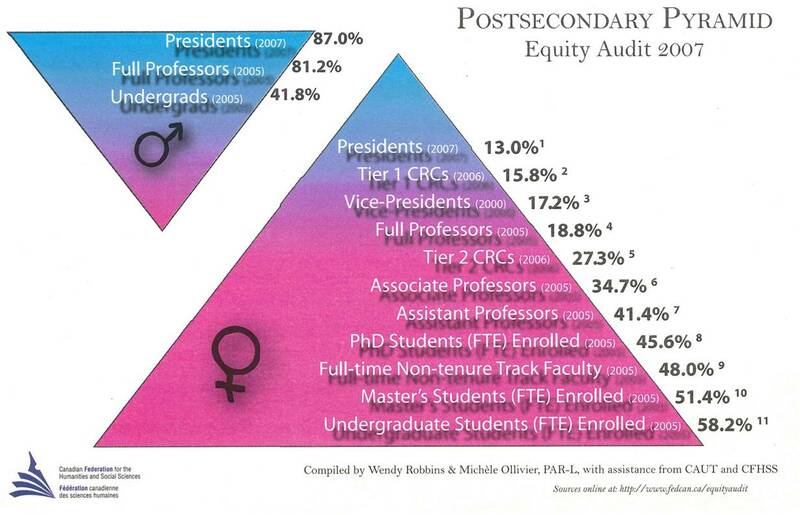 In Newfoundland and Labrador in 2009-10, 79.9% of students entering the Faculty of Education at Memorial University were women. The number of female students entering the Faculty of Engineering was quite different, only 23.4%. These numbers help us to understand why there are more women in managerial roles in Education, and extremely low numbers of female engineers in managerial roles. Some faculties, such as Law, are making rapid headway in the number of women entering the field. In 1981, only one in 20 Canadian lawyers were female. Today, about one in three lawyers are women. Some of these women already have, or are working toward, establishing their own practices. This is an example of a field where women are successfully entering into the managerial hierarchy. Source. If four out of five people entering the education system are women, why is it that school administrators are primarily males? 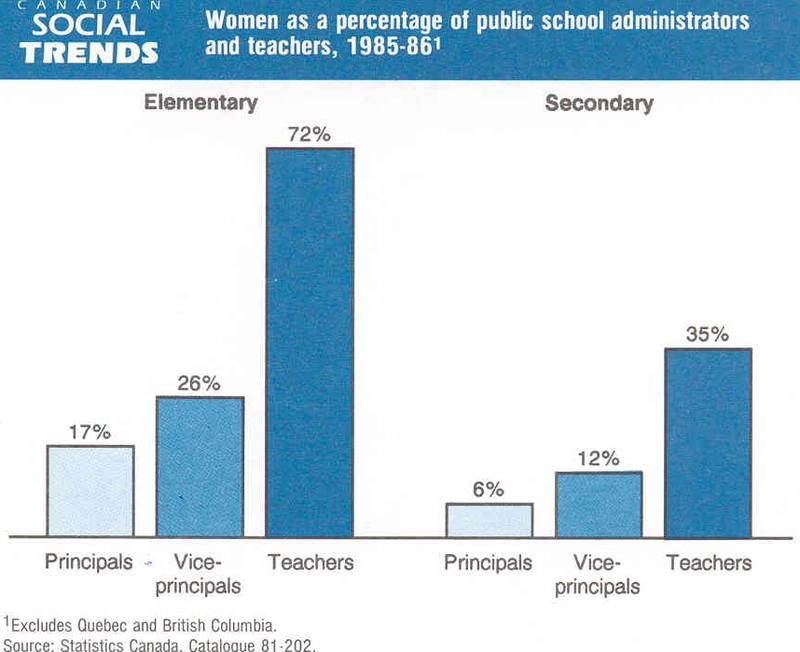 Those women who do advance still achieve mainly middle management positions as vice-principals. Although this data is from 1985-86, it is comparable to current statistics. Source. Although women may be socially predisposed to be patient and nurturing, which makes for good teachers, this is precisely why they should be equally represented in running the schools. There are a lot of factors explaining why women are underrepresented in powerful positions. Johns & Saks suggest that men and women have very different leadership and management styles. Men are said to have “Agentic” leadership traits, while women are said to have “Communal” leadership traits. Johns & Saks argue that Communal traits are how women lead. If this is indeed the case, both classifications display positive and negative traits. Although this is a popular argument, clearly not all men and all women possess these gendered traits. If this was the case, we would not have seen the slow influx in female management as the “Communal” traits seem negative. 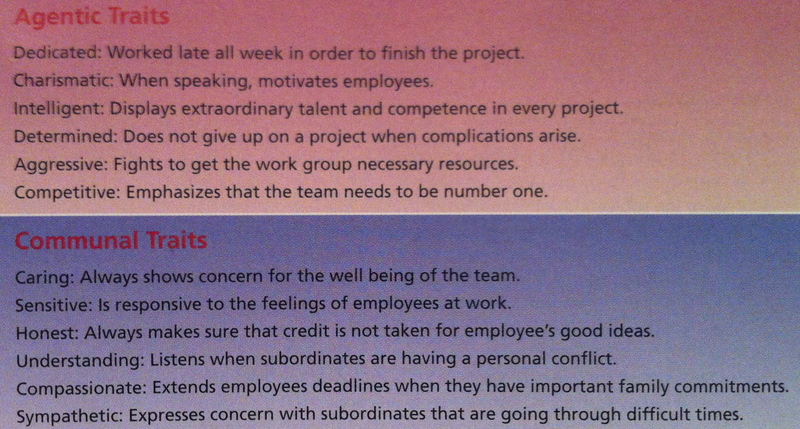 If one assumed these traits valid though, women and men working together in top managerial positions would be ideal. Women bring many strong qualities to leading and managing, yet they continue to be underrepresented. Women have been rapidly entering the workforce since 1960, and yet are still largely underrepresented in positions of power. They have the potential to bring excellence to businesses, schools, and other organizations. Although there are a number of different theories why the problem persists, there can be no doubt that the situation is unacceptable. Women must keep up the fight for their rights to be fairly represented in the managerial world! 1) This link will bring you the Canadian Catalyst website with numerous articles about female inequalities in the work place. It not only discusses womens struggles to advance within the managerial hierarchy, but also many different diversity issues. 2) The 2012-2013 CAUT Almanac gives a great deal of information on the people learning, teaching and managing in Post Secondary institutions in Canada today. This may also give insight into which professions should have more women managing due to higher numbers of women working. 3) This is a great article published in May 2012 that outlines some barriers that women face today when trying to advance in the managerial hierarchy. Ranson, Gillian. Beyond ‘Gender Differences’: A Canadian Study of Women’s and Men’s Careers in Engineering. Gender, Work and Organization. Vol. 10, No. 1. University of Toronto. January 2003. Kay, Fiona, and Gorman, Elizabeth. Women in the Legal Profession. Annual Reviews. 11 August 2008. Dyke, Lorraine. Women in Management – The More Things Change…. Carleton Now. Carleton University. Mary 2012. Canadian Association of University Teachers. CAUT Almanac of Post-Secondary Education in Canada. Ottawa. 2012-2013. Johns, Gary, and Saks, Alan M. Organizational Behaviour: Understanding and Managing Life at Work. Toronto: Pearson, 2011. Print. Thompson, Eleanor. Google Journals. The Special Case of Women in Formal Education Hierarchies. Research Unit of The Collage of The Bahamas. 1978. Tharenou, Phyllis. Wiley Online Library. Gender Differences in Advancing to the Top. International Journal of Management Reviews. 21 May 2003. Catalyst Inc. Research & Knowledge. 2012. Very cool, interesting reading. It would seem that there are more women in top postions now and I seem to hear that there are more. i was reading something this morning that a women came out of retirement to take a ceo job in my industry. Very well done.